Bill Gates recently summarized his yearly letter in an article for the Wall Street Journal entitled My Plan to Fix the World’s Biggest Problems…Measure Them! As an evaluator, I was thrilled. I thought, “Someone with clout is making the case for high-quality evaluation!” I was ready to love the article. To my great surprise, I didn’t. The premise of the piece was simple. Organizations working to change the world should set clear goals, choose an approach, measure results, and use those measures to continually refine the approach. At this level of generality, who could disagree? Certainly not evaluators—we make arguments like this all the time. 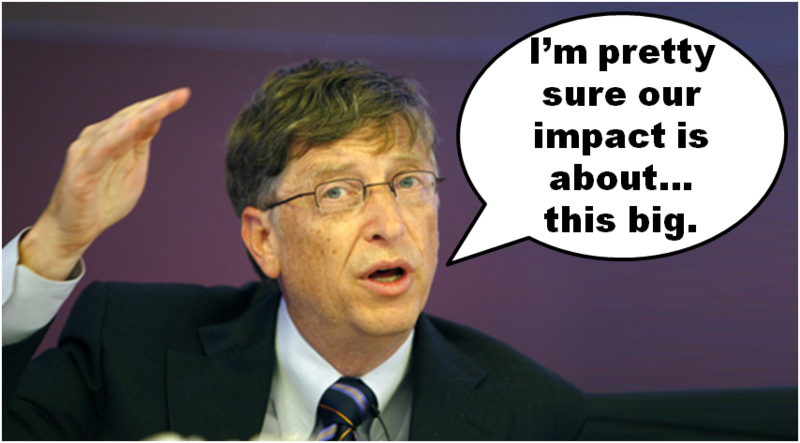 Yet, I must—with great disappointment—conclude that Gates failed to make the case that measurement matters. In fact, I believe he undermined it by the way he used measurements. Gates is not unique in this respect. His Wall Street Journal article is just one instance of a widespread problem in the social sector—confusing good measures for good inference. The difference between measures and inferences can be subtle. Measures quantify something that is observable. The number of students who graduate from high school or estimates of the calories people consume are measures. In order to draw conclusions from measures, we make inferences. Two types of inference are of particular interest to evaluators. (1) Inferences from measures to constructs. Constructs—unobservable aspects of humans or the world that we seek to understand—and the measures that shed light on them are not interchangeable. For example, what construct does the high school graduation rate measure? That depends. Possibly education quality, student motivation, workforce readiness, or something else that we cannot directly observe. To make an inference from measure to construct, the construct of interest must be well defined and its measure selected on the basis of evidence. Evidence is important because, among other things, it can suggest whether many, few, or only one measure is required to understand a construct well. By using the sole measure of calories consumed, for example, we gain a poor understanding of a broad construct like health. However, we can use that single measure to gain a critical understanding of a narrower construct like risk of obesity. (2) Inferences from measures to impacts. If high school graduation rates go up, was it the result of new policies, parental support, another reason left unconsidered, or a combination of several reasons? This sort of inference represents one of the fundamental challenges of program evaluation, and we have developed a number of strategies to address it. None is perfect, but more often than not we can identify a strategy that is good enough for a specific context and purpose. Why do I think Gates made weak inferences from good measures? Let’s look at the three examples he offered in support of his premise that measurement is the key to solving the world’s biggest problems. Gates described how Ethiopia became more committed to providing healthcare services in 2000 as part of the Millennium Development Goals. After that time, the country began tracking the health services it provided in new ways. As evidence that the new measurement strategy had an impact, Gates reported that child mortality decreased 60% in Ethiopia since 1990. In this example, the inference from measure to impact is not warranted. Based on the article, the sole reason to believe that the new health measurement strategy decreased child mortality is that the former happened before the latter. Inferring causality from the sequential timing of events alone has been recognized as an inferential misstep for so long that it is best known by its Latin name, post hoc ergo propter hoc. Even if we were willing to make causal inferences based on sequential timing alone, it would not be possible in this case—the tracking system began sometime after 2000 while the reported decrease in child mortality was measured from 1990. The global effort to eradicate polio has come down to three countries—Nigeria, Pakistan, and Afghanistan—where immunizing children has proven especially difficult. Gates described how new measurement strategies, such as using technology to map villages and track health workers, are making it possible to reach remote, undocumented communities in these countries. It makes sense that these measurement strategies should be a part of the solution. But do they represent, “Another story of success driven by better measurement,” as Gates suggests? Maybe yes, maybe no—the inference from measure to impact is again not warranted, but for different reasons. In the prior example, Gates was looking back, claiming that actions (in the past) made an impact (in the past) because the actions preceded the impact. In this example, he made that claim that ongoing actions will lead to a future impact because the actions precede the intended impact of eradicating polio. The former was a weak inference, the latter weaker still because it incorporates speculation about the future. Even if we are willing to trust an inference about an unrealized future in which polio has been eradicated, there is another problem. The measures Gates described are implementation measures. Inferring impact from implementation may be warranted if we have strong faith in a causal mechanism, in this case that contact with remote communities leads to immunization which in turn leads to reduction in the transmission of the disease. We should have strong faith in second step of this causal mechanism—vaccines work. Unfortunately, we should have doubts about the first step because many who are contacted by health workers refuse immunization. The Bulletin of the World Health Organization reported that parental refusal in some areas around Karachi has been widespread, accounting for 74% of missed immunizations there. It is believed that the reasons for the refusals were fear related to safety and the religious implications of the vaccines. New strategies for mapping and tracking cannot, on the face of it, address these concerns. So I find it difficult to accept that polio immunization is a story of success driven by measurement. It seems more like a story in which new measures are being used in a strategic manner. That’s laudable—but quite different from what was claimed. The final example Gates provided came from the foundation’s $45 million Measures of Effective Teaching (MET) study. As described in the article, the MET study concluded that multiple measures of teacher effectiveness can be used to improve the way administrators manage school systems and teachers provide instruction. The three measures considered in the study were standardized test scores (transformed into controversial units called value-added scores), student surveys of teacher quality, and scores provided by trained observers of classroom instruction. The first problem with this example is the inference from measures to construct. Everyone wants more effective teachers, but not everyone defines effectiveness the same way. There are many who disagree with how the construct of teacher effectiveness was defined in the MET study—that a more effective teacher is one who promotes student learning in ways that are reflected by standardized test scores. Even if we accept the MET study’s narrow construct of teacher effectiveness, we should question whether multiple measures are required to understand it well. As reported by the foundation, all three measures in combination explain about 52% of the variation in teacher effectiveness in math and 26% in English-language arts. Test scores alone (transformed into value-added scores) explain about 48% and 20% of the variation in the math and English-language arts, respectively. The difference is trivial, making the cost of gathering additional survey and observation data difficult to justify. The second problem is inference from measures to impact. Gates presented Eagle County’s experience as evidence that teacher evaluations improve education. He stated that Eagle County’s teacher evaluation system is “likely one reason why student test scores improved in Eagle County over the past five years.” Why does he believe this is likely? He doesn’t say. I can only respond post hoc ergo propter hoc. The old chestnut that lack of evidence is not evidence of lacking applies here. Although Gates made inferences that were not well supported by logic and evidence, it doesn’t mean he arrived at the wrong conclusions. Or the right conclusions. All we can do is shrug our shoulders. And it doesn’t mean we should not be measuring the performance and impact of social enterprises. I believe we should. It does mean that Gates believes in the effectiveness of potential solutions for which there is little evidence. For someone who is arguing that measurement matters, he is setting a poor example. For someone who has the power to implement solutions on an unprecedented scale, it can also be dangerous. Tragic Graphic: The Wall Street Journal Lies with Statistics? Believe it or not, the Wall Street Journal provides another example of an inaccurate circular graph. This time the error so closely parallels an example from Darrell Huff’s classic How to Lie with Statistics that I find myself wondering—intentional deception or innocent blunder? The image above comes from Huff’s book. 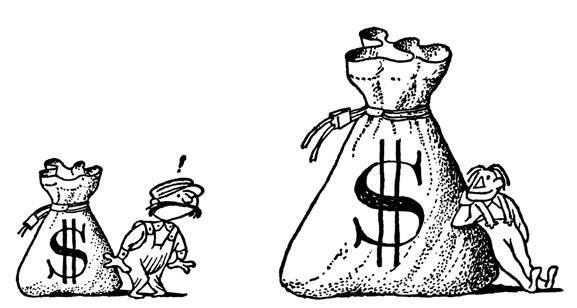 The moneybag on the left represents the average weekly salary of carpenters in the fictional country of Rotundia. The bag on the right, the average weekly salary of carpenters in the US. Based on the graph, how much more do carpenters in the US earn? Twice? Three times? Four times? More? The correct answer is that they earn twice as much, but the graph gives the impression that the difference is greater than that. The heights of the bags are proportionally correct but their areas are not. Because we tend to focus on the areas of shapes, graphics like this can easily mislead readers. …I want you to infer something, to come away with an exaggerated impression, but I don’t want to be caught at my tricks. What were the intentions of the Wall Street Journal this Saturday (1/21/2012) when it previewed Charles Murray’s new book Coming Apart? 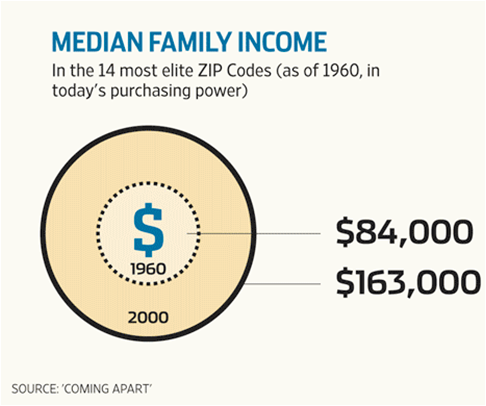 In the published preview, Murray made a highly qualified claim—the median family income across 14 of the most elite places to live in 1960 rose from $84,000 in 1960 to $163,000 in 2000, after adjusting incomes to reflect today’s purchasing power. Those cumbersome qualifications take the oomph right out of the claim. Too long to be a provocative sound bite, the Journal refashioned it into a provocative sight bite. Wow, those incomes really grew! But not as much as the graph suggests. The text states that the median salary just about doubled. The picture indicates that it quadrupled. It’s Huff’s moneybag trick—even down to the relative proportion of salaries! Here is a comparison of the inaccurate graph with an accurate version I constructed. The accurate graph is far less provocative. As a rule, the areas of circles are difficult for people to compare by eye. In fact, using the area of any two-dimensional shape to represent one-dimensional data is probably a bad idea. Not only do interpretations vary depending on the shape that is used, but they vary depending on the relative placement of the shapes. To illustrate these points, here are six alternative representations of Murray’s data. Which, if any, are lies?